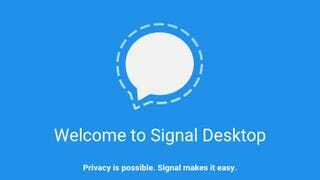 Signal has already offers the best way to send secure and privacy conscious messages on Android and iOS, and now, an update offers everyone the opportunity to us Signal’s on the desktop. The desktop beta had previously been limited to Android users, but with a new update to the iOS Signal app out today, iPhone users can finally take advantage of the simple and easy to use desktop client. The desktop app automatically imports your contacts from Signal on your phone, which is pretty slick. It also keeps your messages synced with your phone, which is super useful. If you already have the app downloaded, just head on over to signal.org/desktop to download the Chrome extension. The setup is super easy, and just involves pointing your phone camera at a QR code. If you’re wondering why you should use Signal over Ghat or any other client, hear me out. Signal is the best app to use if you want secure messages that aren’t being mined for data to sell to advertisers. It uses the Signal encryption protocol, which technologists and encryption experts universally agree is the most secure publicly available way to encrypt your messages. WhatsApp and Google’s Allo use this protocol too, as it has essentially become the gold standard for encrypted messaging, but what takes Signal above everyone else are the folks who develop the app, Open Whisper Systems. They’re a non-profit operated by privacy diehards like Moxie Marlinspike, who aren’t interested in collecting your data for profit. The app itself is super efficient at protecting your data, making it hard for anyone trying to squeeze out any usage data from it. I could go on, but the experts all agree, Signal is the best. On top of all that, it’s free and easy to use!